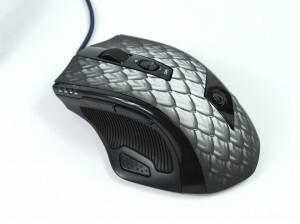 A lot to offer in terms of customization and comfort for a relatively low price. Only the dragon icon LED is customizable. 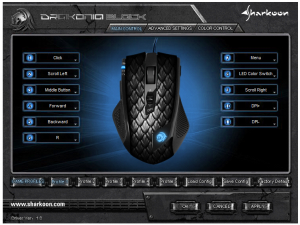 The Drakonia Black Laser Gaming Mouse from Sharkoon is really an impressive piece of hardware. With laser precision and near unparalleled comfort, combined with loads of opportunities to customize it to your likings, you’ll find a lot to like at a really reasonable price. If a mouse can win your heart with sheer coolness, then prepare to swoon when you feat your eyes on the Drakonia Black. It has dragon scales, people – dragon scales. Not real ones, obviously, but the pattern that covers the top of the mouse and tiny dragon icon will definitely score points with certain fans for aesthetics alone. Naturally, though, even if the awesomeness wins you over, a mouse has to have a lot more than pretty to part you with your hard earned cash. For one thing, comfort is a huge deal. Even a mouse than can perform magical gaming feats at the push of a button won’t be a joy to use if it doesn’t rest comfortably in your hand – and does it ever. 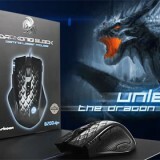 I have tested many a gaming mouse, but the Drakonia Black is one of the most comfortable, by far. The scale covered finish is so silky smooth your fingers will feel like they are resting in organic butter as you click the day away, with the 4 way scroll wheel placed conveniently in the center.. The ergonomic sides are ridged for your…comfort, with a smoothly textured surface that allows your fingers to rest comfortably without any slippage. The textile covered cord ensures that you won’t have to deal with cord snarls or jumbles, and the gold plated USB connector means corrosion isn’t ever going to be a worry. The bottom of the mouse holds the Avago 9800 laser sensor that lends precision and accuracy to your game with the ability to reach up to 8200 DPI. Centered below it is a removable panel which opens to reveal the weighting system of the mouse. The six weights inside can be quickly customized to your weight preferences, no matter what type of game you want to play next. No tools are needed – they wiggle right in and out with ease. 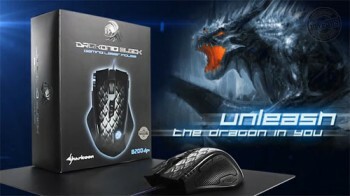 The Drakonia Black has a series of four blue LED’s along the right hand side of the mouse, while the Drakonia logo dragon in the center of the mouse has a default blue light that is customizable to your personal preferences in a variety of colors and intensities. The mouse contains eleven different buttons scattered all around the mouse, each of them programmable to your preferences as well. This is a huge step for convenience, particularly in games that require a lot of functions, like MMORPG’s or real time strategy. 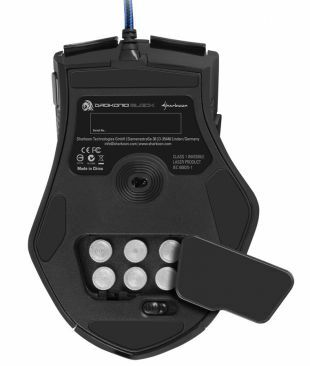 In order to program LED’s and buttons, you’ll need to download the Drakonia Black driver and software, which is included with the mouse in the form of a mini disc (the manual is included on the disc as well). 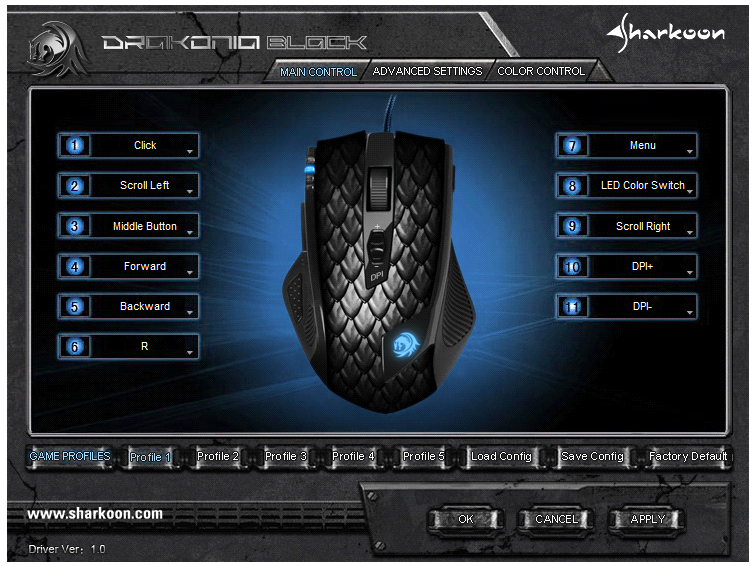 If discs aren’t your thing, the software can also be accessed via a quick download from Sharkoon’s website. This allows you to adjust things like your speed and sensitivity, assign functions to the buttons, as well as customizing the color of your LED. The software is really quite intuitive and simple to use, regardless of your level of experience with that sort of thing. The Drakonia Black Laser Gaming Mouse from Sharkoon is really an impressive piece of hardware. With laser precision and near unparalleled comfort, combined with loads of opportunities to customize it to your likings, you’ll find a lot to like at a really reasonable price. The Drakonia Black is a quality product that will likely be topping a lot of wishlists this holiday season.